The Season of Ubuntu feels like the perfect moment to give a special mention to three communities that are close to my heart and that have greatly influenced my creative work. Each one of these has strengthened and nourished my creativity and, in turn, my art has become part of the wider community so that it can inspire and inform others. 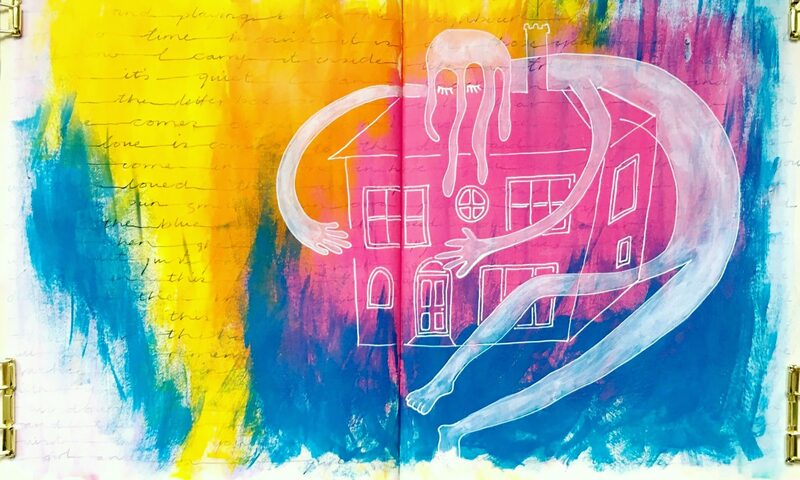 Get Messy Art Journal has completely revolutionised my creative life. When I found this incredible art community, less than two years ago, I had no idea just how nourishing, inspiring and supportive an online community could be. In fact, to call it an online community feels a little strange, as many of the friendships I have made through Get Messy have become real-life, face-to-face connections too. One of the most valuable things I have received from Get Messy is the experience that I don’t have to undertake the creative journey alone. There are like-minded artists from around the world who get excited about a particular shade of neon paint, love to take part in the same whacky creative challenges, and have a thirst for learning new approaches and techniques. And – as if finding my artistic tribe wasn’t enough – I have had the good fortune to be on the 2018 creative team of Mess Makers. I have been learning so much and loving every minute. If you are looking to expand your creativity and find your artistic tribe, look no further! You can find out more about how to join in the fun here. While all this art-making has been going on, I have spent many happy days and nights at EarthHeart UK, a beautiful centre in The Forest of Dean. In 2017, I participated in an incredible year long journey with Jewels Wingfield called Initiation: Into the sacred feminine. During this time, I felt a strong sense of reconnecting with the earth and with the beauty and wisdom of being a woman. My experience at EarthHeart awakened powerful images in my inner world and the pages of my art journal became rich with earthy landscapes and circles of ancient women. These images helped to ground the transformation that was taking place in my life and spoke powerfully to other women who were longing, as I was, for a deeper connection to myself and to the earth we live on. You can find out more about the transformational workshops and events going on at EarthHeart UK here. I am so happy to have been invited to become an Artist Partner with the wonderful reforestation organisation, Treesisters. Treesisters are strengthening women and nurturing the trees in an incredibly beautiful and empowering way. You can find out more about this incredible organisation here.